Have you planned a weekend in Venice and are tired of researching from different sources? 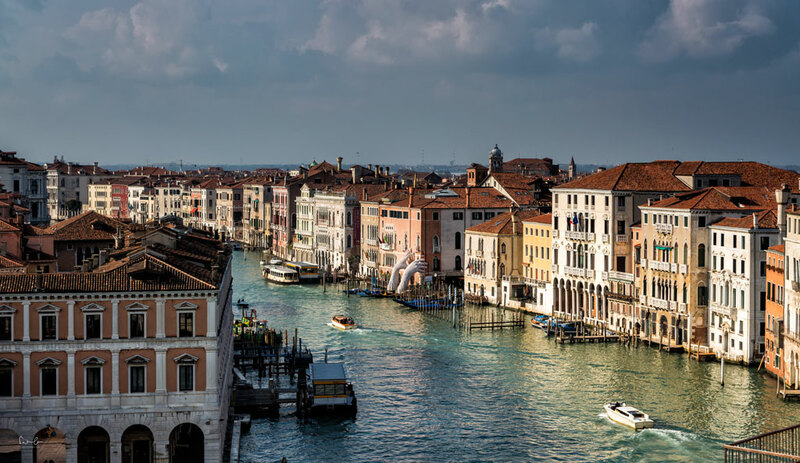 Then stay with me: Here is a comprehensive guide to Venice covering when is the best time to go, how to get there and around, things to do, wonderful museums, places to stay, restaurants and bars and essential things you should know for your stay in the lagoon city. I did it again. I fell in love with a city and it’s Venice this time. I have avoided Venice for quite a few years because I had this thought in my mind, that it is just too crowded for me. But the thought of the canals, the colorful buildings, the Palazzos and the romance has never left my mind and so I booked a trip for March. And yes, it was crowded because it is Venice, however, you do find less packed areas and there is just so much to adore that there’s actually no way of not visiting Venice at least once in your lifetime. Where to eat in Venice? Where to go for a drink in Venice? This is the 100.000 $ question. The good thing is: Venice is one of those all-year destinations. The downside: It is pretty much packed all year long. Spring, summer and early fall are the nicest periods in terms of temperatures and weather. However, these are the busiest seasons. If you want blue skies, strolls in t-shirts and a high probability of nice weather, go between April and October. When not to go to Venice? Try to avoid July and August because it is jam-packed. 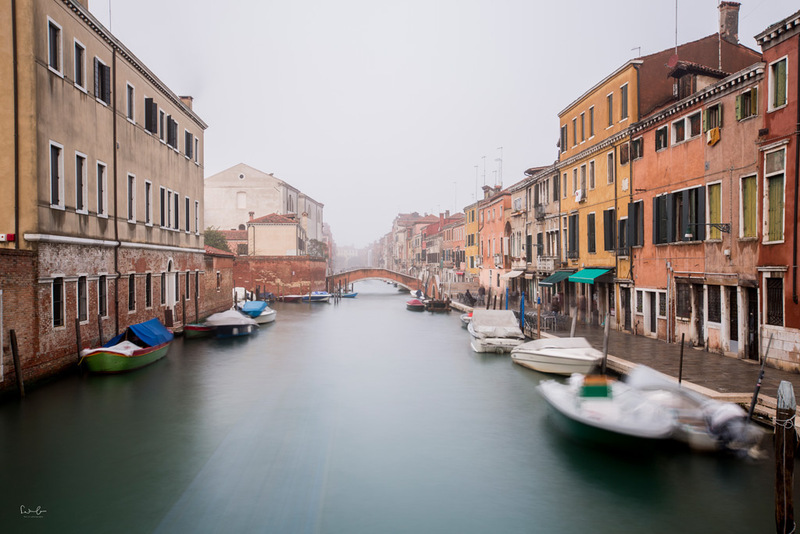 If your dream is to photograph Venice in fog, November is a good month to go. From December to February the streams of tourists get fewer however it can be quite chilly and damp. But there’s this super clever saying there’s no bad weather, but only bad clothes, right? Haha. Prices of hotels increase in high seasons and during the main events such as carnival or Biennale. 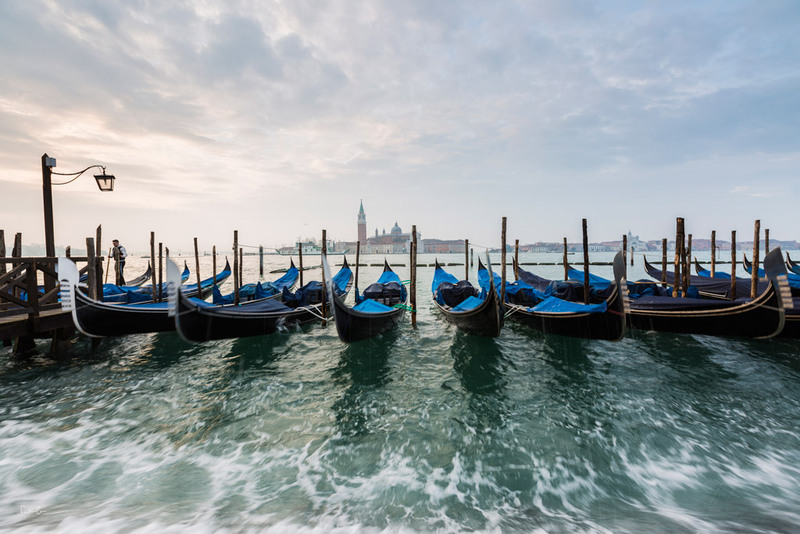 The best way to get to Venice is to catch your cheapest flight deals to Venice Airport. An easy way from the airport to the city is to take an AliLaguna boat for 15 Euro p.p. Leave the airport building and go left towards the yellow boats. 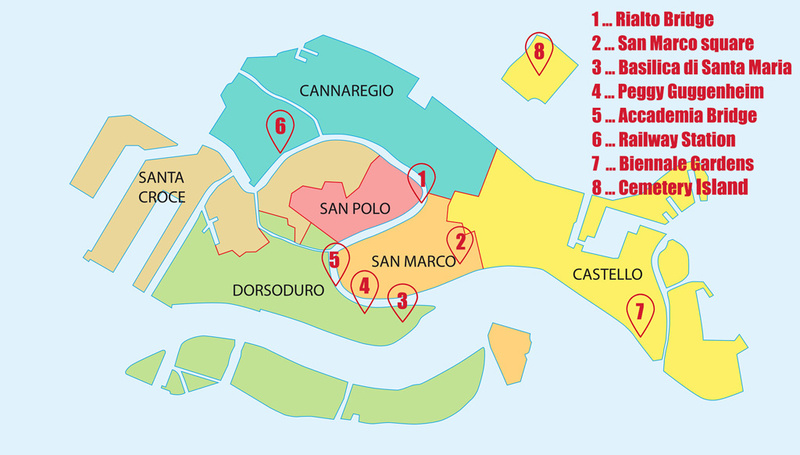 They take you to St. Mark’s, Lido, Murano Arsenale or Zattere. For 8 Euro, take the ACTV bus to Piazzale Roma from where you can hop into a Vaporetto. First class to Venice? No problem. You can also book your private boat from the airport to your hotel or close to it. If you arrive by train, the station is called Santa Lucia which is on the island of the city right next to the Vaporetto station Ferrovia. Arriving by car is possible, too. 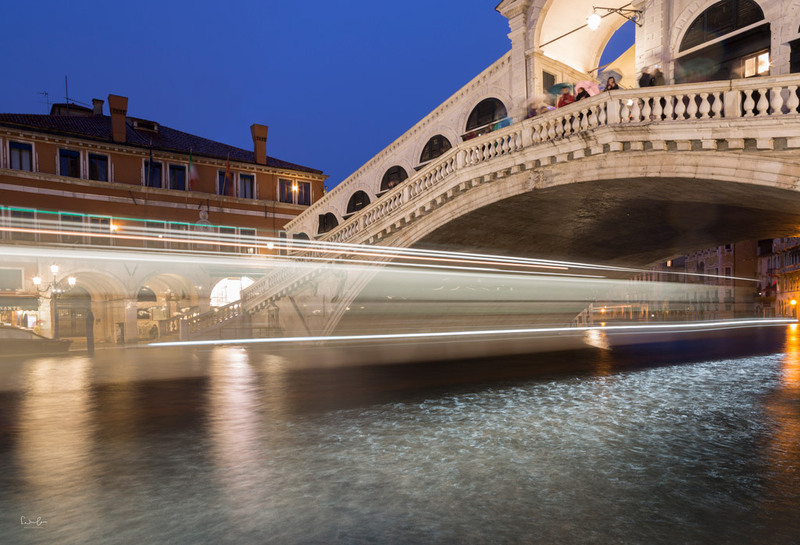 Park your car at Tronchetto and use the people mover and the Vaporetto to get to your hotel. The parking garage closer to the center is San Marco at Piazzale Roma. Tronchetto is the cheaper option (21 Euro per day) but most of the hotels have agreements with the parking lots and you’ll get 20% off. Here’s your city map of Venice which gives you an overview of the different districts. Cannaregio in the North of the city with its main tourist road Strada Nova has some very quiet corners as well as beautiful bridges and canals which I strongly recommend you to explore. San Polo is the district southwest of the Canale Grande. It houses the Rialto Bridge and the fish market. San Marco is a conglomerate of fascinating architecture: Doge’s Palace, San Marco Square, Bridge of Sighs, the Opera building just to name a few. Dorsoduro shows the real Venice and is less crowded than San Marco or San Polo. 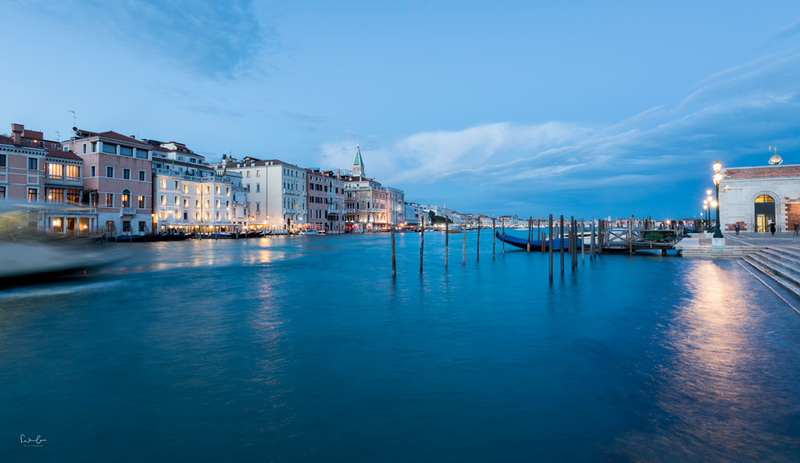 You’ll find the beautiful Accademia Bridge (March 2018: currently under construction) or the Peggy Guggenheim Collection there. Castello is a large district and quite diverse. You’ll find spots packed with people such as the Riva degli Schiavoni as well as residential areas in the East. The cheapest way is by foot. It takes you about 45 minutes to walk from the North to the South and about 1 hour from West to East. Be sure to get lost quite a few times, so please don’t take these time specifications too seriously. The nobler way of getting around in the lagoon is by water taxi. The prices are quite premium and you might pay 50 to 70 Euro for just a short way within the city. From the airport to your hotel the price can be way higher than 100 Euro. 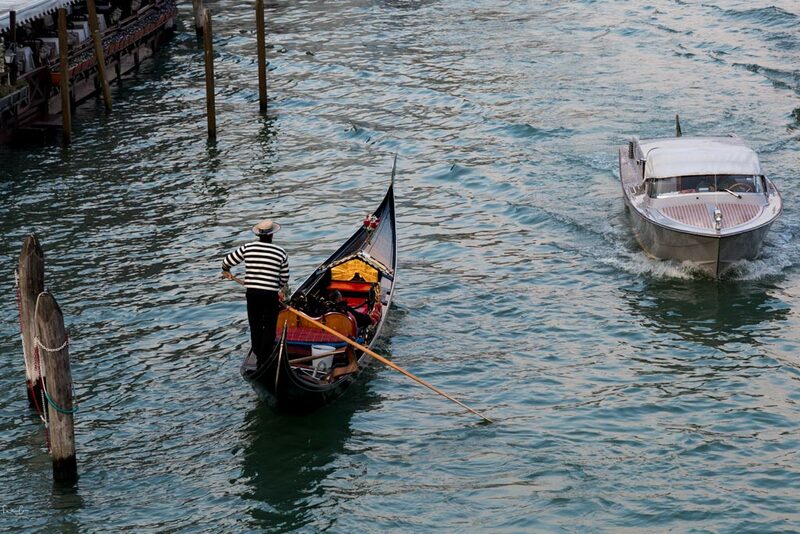 Be aware that water taxis do not drive along narrow canals. The upside of a water taxi, however, is that you can find plenty of them all along the Canale Grande. 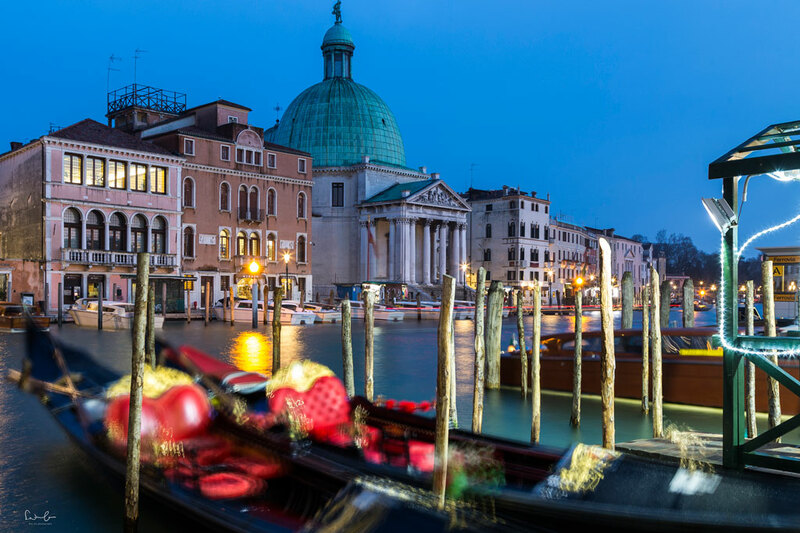 For about 100 Euro you’ll get 35 minutes of romance in a real Venetian gondola. Unfortunately, eating and drinking are not allowed, so better forget to sip your bottle of Prosecco with your lover. The Venetians hop on a Traghetto, a gondola rowed by 2 gondoliere carrying around 14 people in one boat. A really great invention of Venice is the city pass. 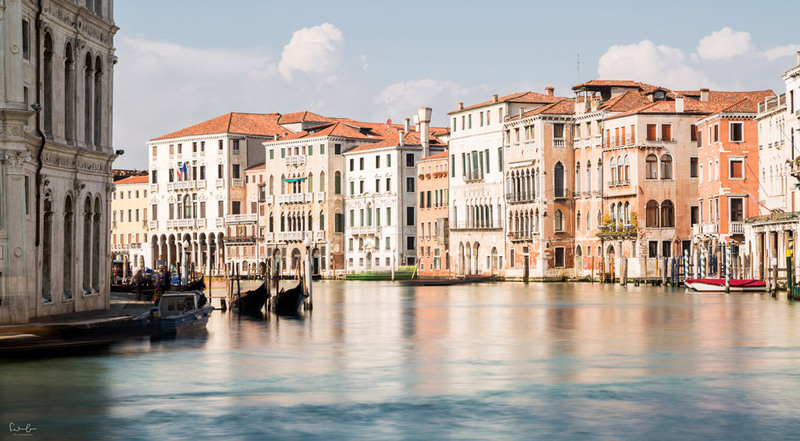 On Venezia Unica, you can customize your personal Venice city pass. First, you create a card with your name. Then you choose the services you want to purchase. The services include museums, churches, public transport, parking and tour packages. You add whatever you need to your cart, pay and pick up your pass from a sales office or at any ticket vending machine in Venice. You can also find combined tickets under the „Best Deals“ section which allow free entrance to several museums in Venice. Hotel Carlton at the Grand Canal has a Palazzo-style interior and the rooms are furnished with antique pieces. From the rooftop bar, you’ve got a great view of the Canale Grande. A big bonus point for the cleanliness. The hotel is located on the opposite side of the train station. The second hotel I stayed at was Palazzetto Madonna, a historic building close to the Rialto bridge and just a few meters away from the Vaporetto station S. Tomá. The rooms are beautiful, some with antique furniture, some very modern but all quite spacious and clean. Ca’ Pesaro: Located on the Grand Canal this museum houses Klimt, Kandinsky and Chagall as well as the Museum of Oriental Art. Temporary exhibitions take place on the second floor. Galleria dell’ Accademia next to the beautiful Accademia bridge houses Venetian art. You will find paintings from the 14th – 18th century from Italian artists such as Bellini or Tiziano. The Doge’s Palace on the famous Marco square is not only an amazing architectural masterpiece with a remarkable history but also a museum showing temporary exhibitions, the Doge’s Apartments and the Institutional Chambers. 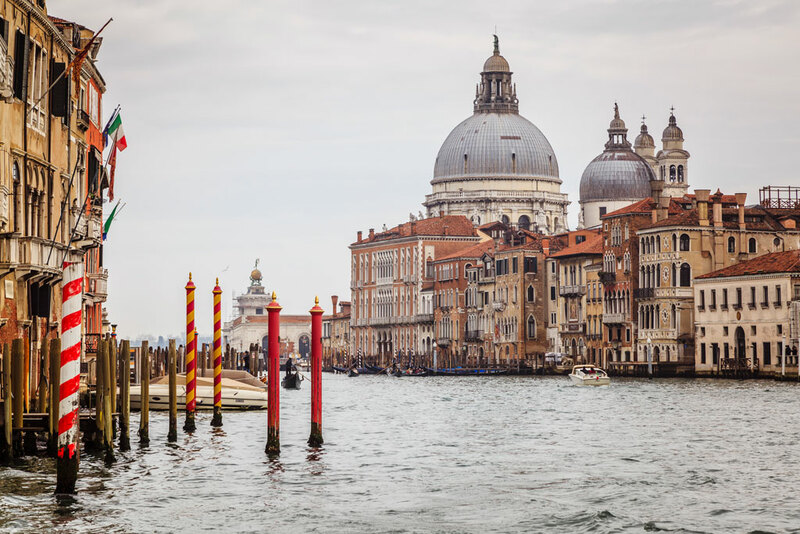 Peggy Guggenheim Collection with its amazing view of the Grand Canal is a modern art museum featuring Picasso, Kandinsky, Miró, Klee, Ernst, Magritte and many more. 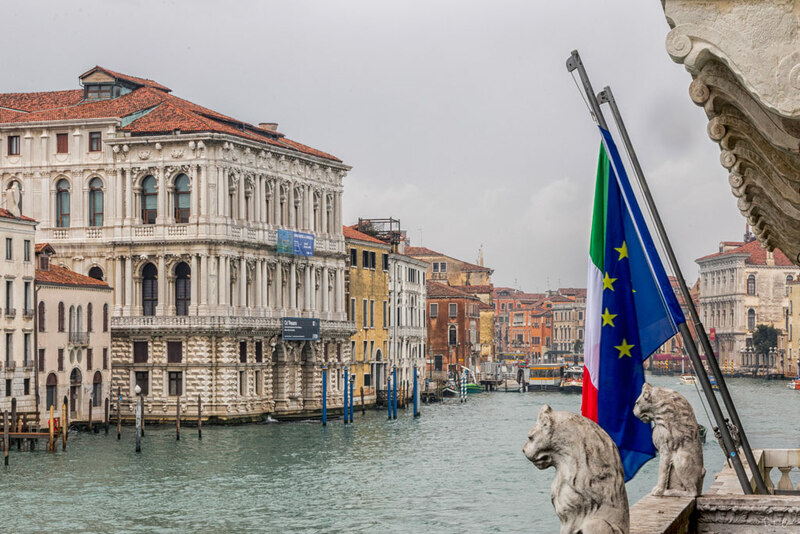 Palazzo Grassi on the Grand Canal is a contemporary art museum with temporary exhibitions in the last Palazzo that was built on the Grand Canal before the Venetian Republic fell. 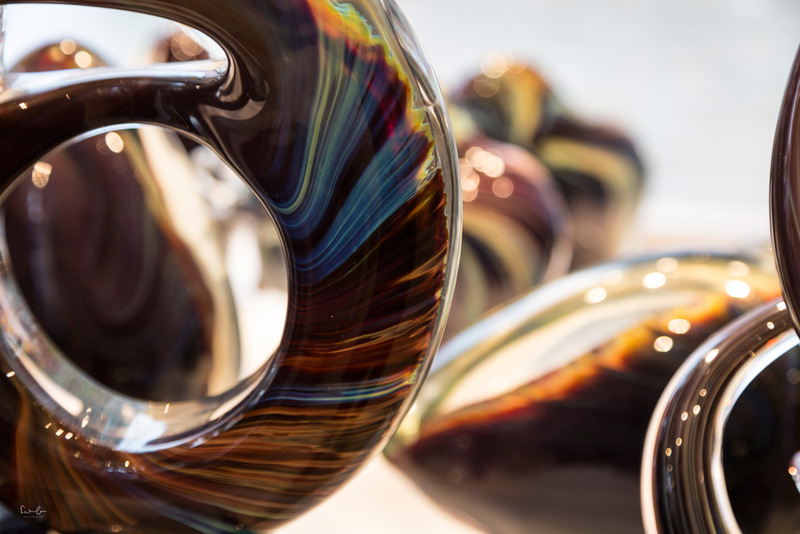 Murano glass is famous all over the world. Famous for its beautiful shapes and colors and also for its premium price. It’s just a short Vaporetto ride to the island, where the glass is being blown. There’s also a museum, Museo del Vetro, with an amazing collection of historic Murano glass. The fishermen’s island with its famous colorful houses and the clotheslines can be reached in approx. 1 hour and 40 minutes with the Vaporetto number 12. If you have time and the sun shows up, go there and don’t forget your camera. Book a half-day boat trip to Murano and Burano here. Visit the Rialto market and watch the locals bargain their grocery. 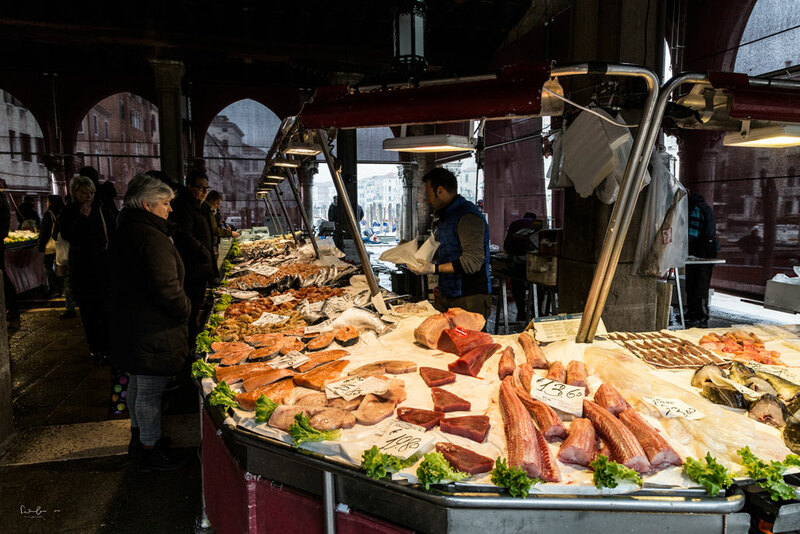 The choice of fresh fish is stunning and the colors of the fruits are beautiful. Sit down for a Spritz in a bar just around the corner. Leave the main paths behind you and walk along the little narrow alleys. You will find beautiful canals, buildings, little authentic restaurants, fewer tourists and gorgeous shops and boutiques that invite to spend some Euros. 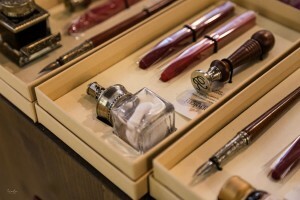 Arcobaleno Pigmenti (Dorsoduro 853/d) is a wonderful shop where you can buy color pigments, beautiful seals and pens. Grab your camera and your Venice pass, hop on the Vaporetto number 1 or 2 and take a ride all along the Grand Canal. You will see beautiful Palazzos and churches and the three bridges, Rialto, Accademia and Scalzi from a different viewpoint. Try to find some space in front of the Vaporetto to have the best view. Especially now, when the Accademia Bridge is under construction, it is a way to capture the Basilica from this angle. There’s a little island north of the city of Venice housing the cemetery of San Michele. You will find graveyards of famous people like Igor Stravinsky or Ezra Pound. Be aware that taking photos within the premises of the cemetery is not allowed. Whenever I travel, I try to avoid very touristic restaurants. When I read „touristic menu“ and see menus with pictures from the dishes, I flee like a hunted deer. It is not the easiest thing in Venice to find great restaurants with more locals than tourists. Well, I guess there are way more tourists than locals anyway. It is so beautiful to stroll through Venice and catch a drink or two in the corner of a cozy bar. One of those bars is Il Mercante in Fondamenta dei Frari 2564. The bartender mixes the drinks with so much passion, I recommend the Italian75, a gin-based cocktail. The rooftop bar of the Hilton Molina Stucky in Giudecca makes sure that the romance factor goes on and on. Enjoy a divine view of Venice while sipping your cocktail. On the other end of Venice, you will find Al Timon Bragozzo for a glass of wine. Adriatico Mar is a wine bar with good music and little sandwiches and on Campo Santa Margherita you’ll find many restaurants and bars, tourists as well as locals. I hope I’ve covered the most important things in this guide to Venice. Are you missing something? Stay with me for some insider tips and the most beautiful photo spots. Disclaimer: This article contains affiliate links which means I will earn a small commission if you purchase/book through my links. This is without extra costs for you. Thank you for supporting me. Special thanks to Venezia Unica who provided four 24-hour public transport tickets for free. I have visited Venice for a day trip and fell in love. I really would love to return to explore more and take better photos. Yours are really stunning, well done! A terrific guide, Nicola! I’ve been to Venice a lot – rented apartments there for months at a time – it’s one of my favourite cities in the world. We always take the water taxi from the airport. Yes, it’s expensive, but it’s the best way to arrive. And my favourite restaurant is Antiche Carampane. Venice has loads of wonderful little restaurants like that hidden away down alleyways. When you return do a cooking class with Countess Enrica Rocca: https://grantourismotravels.com/2010/06/21/cooking-with-the-countess-in-venice/ So much fun! Thank you so much, I’m glad you like it. And thanks for your insider tips. Great and informative guide! This makes me want to go back so bad! I absolutely loved Venice even though I only went for a day trip. It just wasn’t enough time. We didn’t experience the smelly canals either, must have been the time of year. Fantastic and comprehensive guide. We’re booked to go back to Venice next month, it’ll be our third trip but the last visit was more than a decade ago, so it’s great to read the reminders on transport and other handy advice. Thank you so much, Louise. I hope you and your husband will make it to Venice, soon. Super great guide! I *almost* bought an impulsive ticket to Venice last week – your photos are so gorgeous so now I’m re-evaluating why I didn’t?! Ahhhh Venice is so beautiful! But it’s true what you say that it’s busy all year round, sadly. Thanks for your visit, Ellie. 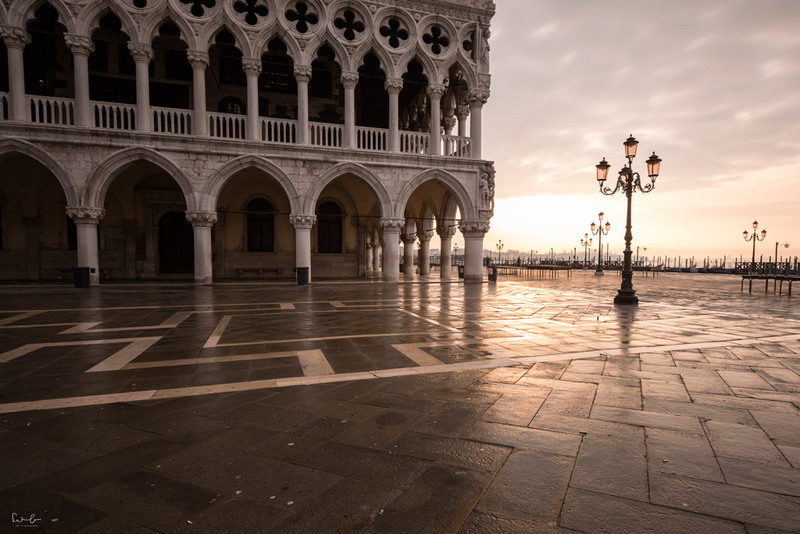 Sadly, yes but Venice is still worth visiting and you’ll find quiet places there, too. I love Venice and this guide has so much useful information. I have pinned for reference on my next trip back. 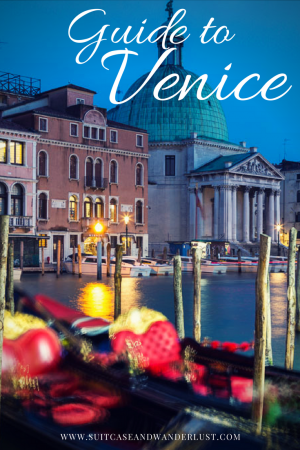 Reading this has me craving a trip to Venice. So well written and in such great detail!! What an excellent guide. I look forward to seeing your posts in the future! Great article – girls trip is booked for September so I can’t thank you enough for your insider tips. Thanks so much. Oh, that’s great. Have fun on your girls trip. 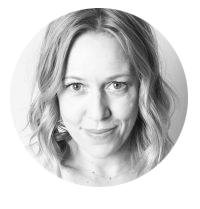 Loved loved loved finding your blog and your lovely photos. I love Venice. I never noticed a smell either but I’m usually there when it’s cold. I’ve been there several times one needs to spend at least a few days there to marinate in the uniqueness of it all if you can bypass the commercial part of it 🙂 I will be returning soon and I can’t wait. When I upload photos I will add a link to share if I can update here. Do you mind sharing what photo gear you used? Thank you, Suzie. I’m happy to hear you like my blog and photos. I’ve written a post about the gear I am using https://www.suitcaseandwanderlust.com/travel-photography-gear/. Let me know if you have any questions.